I rented Scott Pilgrim vs the World last night and loved all video game references. I noticed ones like the Zelda Link to the Past theme, Q*bert sound when a guy jumped down the stairs, and all the enemies turning into coins like in River City Ransom. There were probably tons of references I missed so I decided to watch the commentaries and trivia on the Bonus Features menu. "This disc is intended for rental purposes only and only includes the feature film." "Own it on Blu-Ray or DVD to view these bonus features and complete your moving watching experience"
What a pain. I was watching a rental and not a purchased copy. The deal with a movie rental used to be I get it for a limited time vs owning it and being able to watch the movie as many times as I want. "RENTAL COPY: Buy the DVD or Blu-Ray to see the rest of the movie"
Has anyone else seen this on their DVD's from Netflix or RedBox? What do you think about it? I was out shopping for Christmas presents this year and saw tons of signs for Super Mario All-Stars Wii at my local Best Buy. Every corner of the game section had a Wii case with Mario all over it, but none of them had the game inside. They only had other Wii accessories and games. The game was all sold out according to the sales clerk. My local Target, two GameStops, and a Wal-mart were the same way. I checked online GameStop and they were all out too and so was Amazon. The game is reselling for $55-60, which is nearly double the $29.99 MSRP. Nintendo must not have made very many copies. 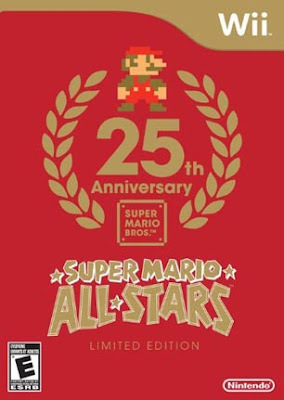 Do you think Nintendo will keep this as a limited edition and not make any more copies or will more Mario All-Stars flood the stores soon after the new year? If your looking to make some extra money next holiday season and you have some extra storage space - buy and resell Beatles Rock Band Limited Edition for Wii. This year the price of Beatles Rock Band for Wii increased from about $230-240 in the summer to $425 in December. The lowest price on Amazon right now is $430 and eBay is $479. 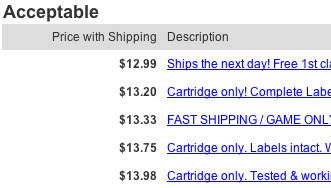 These are list prices so people might not pay these high prices, but I personally sold a Limited Edition Wii version in December for $380 and the most recent sale on ebay was for $300. Next August or September you find the lowest prices for the complete package (you could use our handy current listing comparison feature if you want). Buy five or six of these and store them in your garage, basement, or anywhere else. Around the 1st to 15th of December list these for sale on eBay and Amazon with a Buy It Now price of $340-350 and see if they sell. My guess is next year you will be able to make some money doing this. MTV Games isn't making more of these limited edition bundles and they seem to be really popular Christmas gifts. The Used Prices tab is the content you see when loading the page. It highlights typical prices from various online retailers. The Current Listings tab shows the comparison of live listings feature that we've mentioned before. Unlike before, the current listings feature doesn't destroy the page; so you can click back to Used Prices instantly. The Completed Auctions tab displays information about recent sales on eBay. When the tab first loads, it looks similar to the pop-up dialog we used before, but inside a tab. It shows the date, amount and auction ID for each auction. A moment later, we ask eBay for some additional details about each auction and expand the table with the auction's title. Having the title immediately available makes it easier to compare the several auctions without having to click through to eBay. If you notice a mistake, like that "Disc 2 only" copy of FF VII above, click the thumbs down button so we can remove it from our database. Seeing the title also makes it easier to compare prices based on condition. If you're looking for a copy with the original box and instructions, just scan through the list to find a similar auction. Let us know in the comments what extra details you'd like to see. Gamestop is doing a promotion for 20% off all used games. The discount is only available on their website. When you are comparison shopping on VGPC keep this extra discount in mind. It might make the Gamestop price cheaper than other sites on a few games.